Hi Everyone, Micki here to share a fun art journal page I created using stamps which you may not have thought to use in a mixed media project. 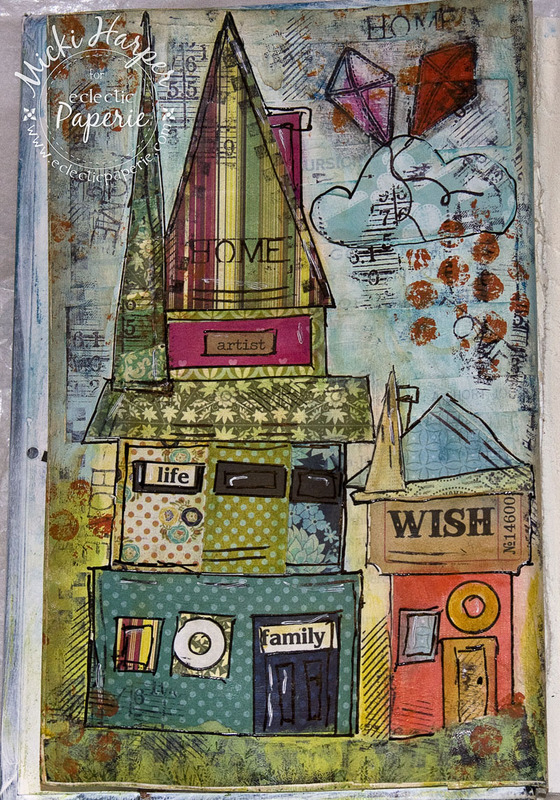 This is the first journal page I created in my altered book, so I thought it only fitting it should start out with a couple of willy wonky houses. 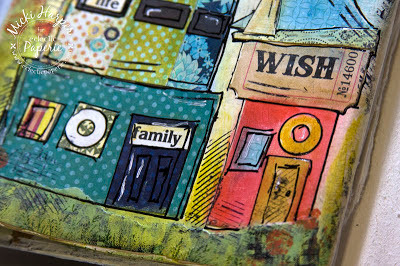 One thing that I absolutely love about mixed media is that anything can be used, especially scraps of left over paper. 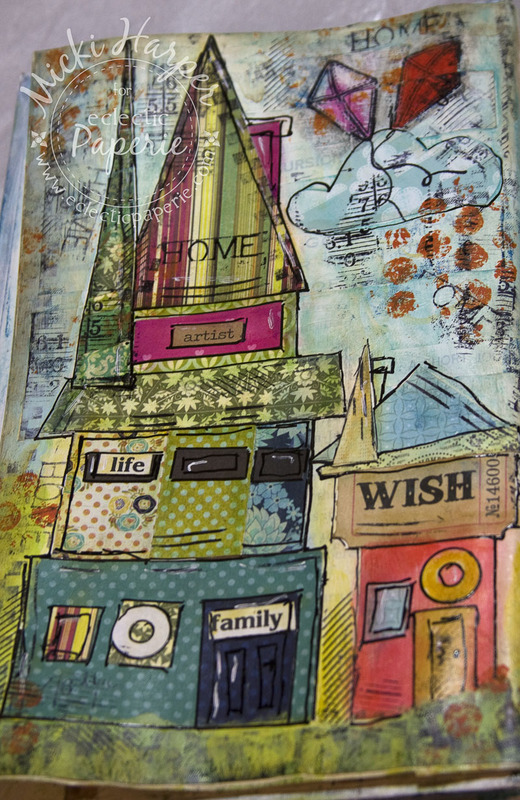 I started by layering scraps of papers to the book page using Claudine Hellmuth Matte Multi Medium. Next I grabbed my Basic Grey PB&J paper pad scraps and started cutting the different elements of the houses. Then I started building the houses on my page, again using multi medium to glue the pieces down. Now at this point I should tell you, that I had completely forgotten to apply paint to the page. As soon as I had all the house pieces glued down and stepped back, I remembered! Using both a brush and my fingers, I colored the background with Ranger Adirondack Acrylic Paint Dabbers. I just unscrewed the dabbers and poured a little paint onto my non-stick craft mat. Next I took a look at the stamps in the Country Charm set from Wplus9 Design Studio and the Big Greetings set from Market Street Stamps. This worked really well (excuse my inky fingers) because I was able to control how much of the image to stamp. For example, on the roofs, I wanted more of the image but along the windows and doors, less. 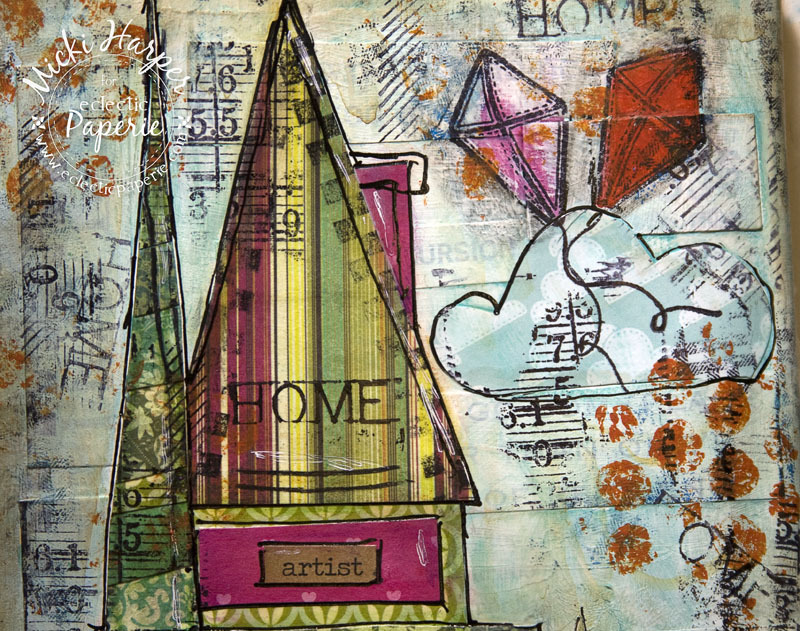 Tim Holtz Stampers Anonymous - Classics #6 is perfect for mixed media and so is pretty much any stamp from Studio 490. 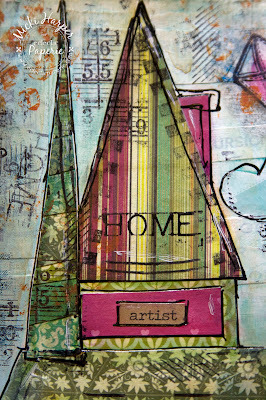 Actually, ANY stamp is perfect for mixed media. The paint dots were made with recycled bubble wrap. I also stamped the kite from Old Fashioned Afternoon. All the stamps were inked with StazOn Jet Black ink. A layer of Claudine Hellmuth Matte Multi Medium was the last step to seal the page. And I have to admit, I totally love this page. Love the willy nilly shapes, the texture and definitely love using those scraps! 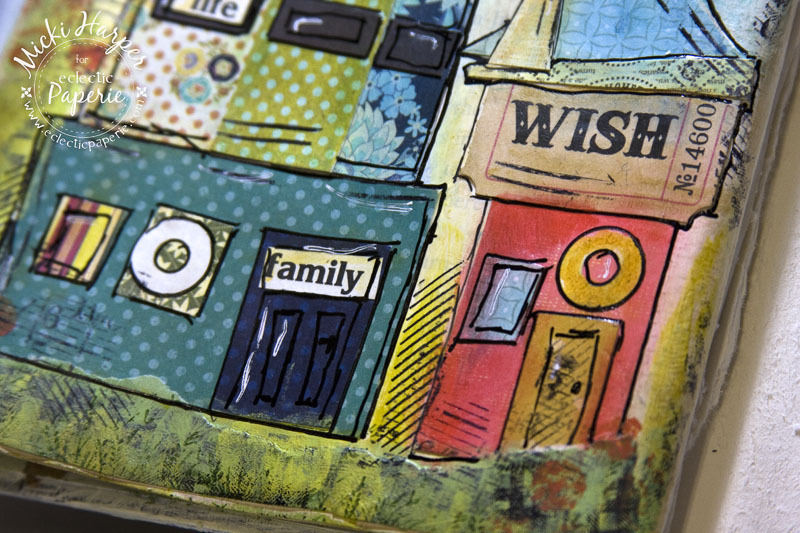 I even had my granddaughters start their own little altered book and make a "Home" page - lots of fun. So, be sure to look at the stamps you already have because any stamps will work in mixed media. Ok, some obviously better than others :-). 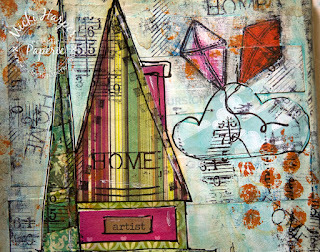 And if you haven't already checked out the eP Shop, you need to check it out because I was squealing in delight to see all the new Studio 490 stamps and......(doing a happy dance) Balzer Designs stamps. Woohoo! 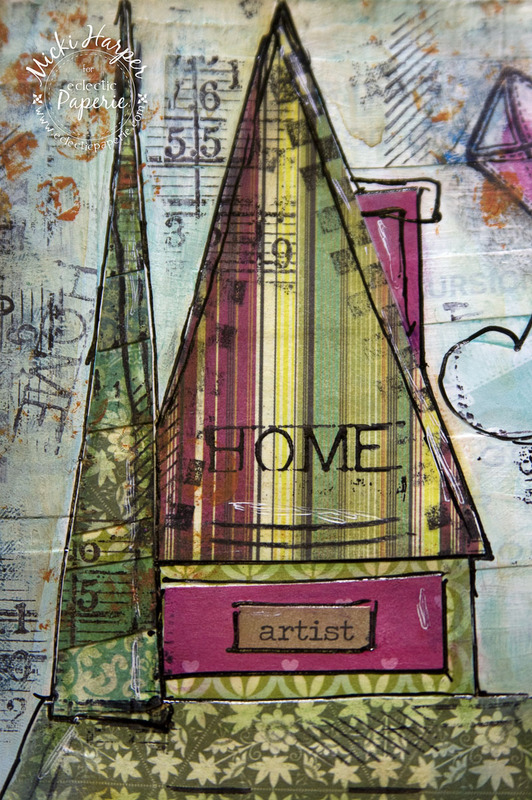 Thanks for stopping by and I hope you are inspired to grab your stamps, paints and inks and get inky! This is awesome. Love the wonky houses and that layered background. 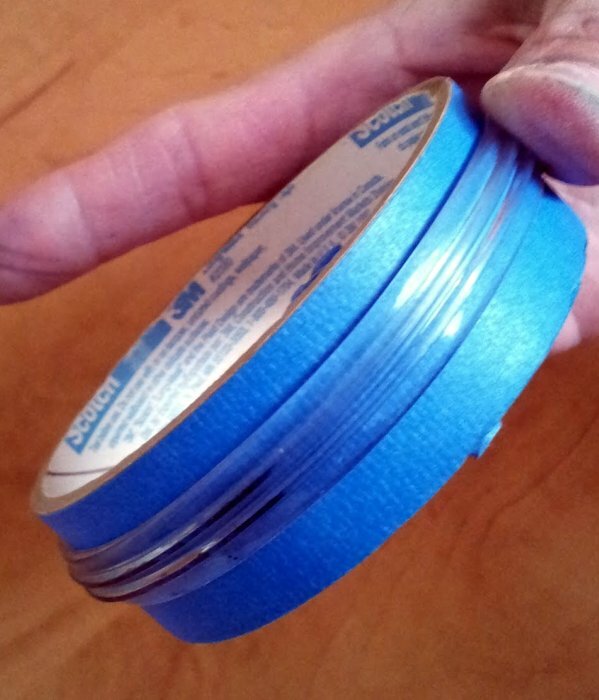 Great idea to use the roll of painters' tape for a tool. 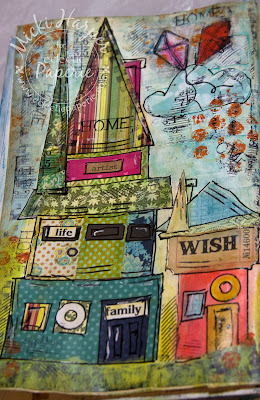 Art journalling and mixed media are so freeing and fun. Great results here! Oh wow, Micki! This is fabulous!! Love everything about it!! You go, girlfriend!! Wow, Broni, this art journal page is phenomenal! Wow, I just love this page. Thanks for sharing. Oh my goodness....how freakin' awesome is this page? LOVE your HOME! 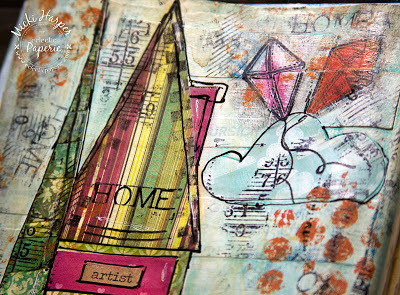 OMG ... love your journal page! I can't wait to get back to my journal to have fun...great inspiration ! Oh Micki! I only wish you knew how very much I love this piece of artwork - outstanding. I need to get busy with my art journal!! !